The Embassy of the Netherlands has organised the fourth DiploHack already, this time being dedicated to social innovation in Tbilisi. Georgian startups will have the chance to take part in the 48-hour long hackathon on social matters and diplomacy issues on the 30th of May until 1st of June. About 60 participants gathered to GOETHE - INSTITUT GEORGIEN to improve the relationship between citizens and decision-makers. Read on to find out more. 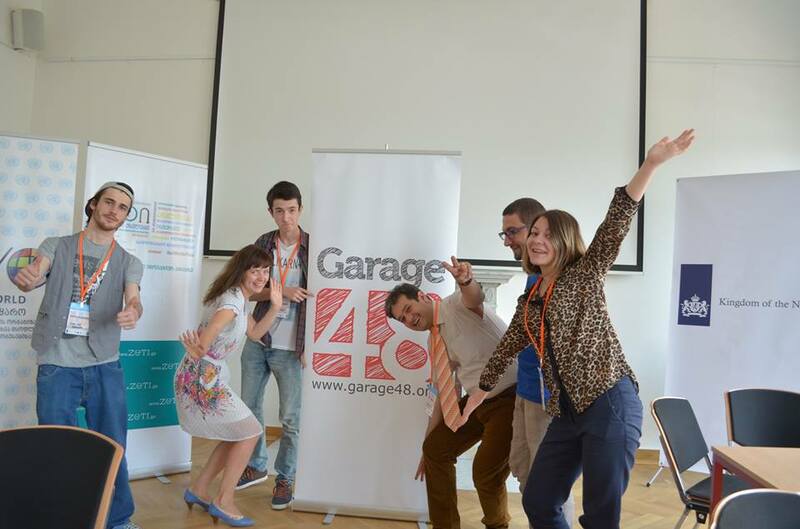 Unsurprisingly, DiploHack sent the experienced team of Garage48 from Tallinn to mentor and execute the firsth social hackathon for the capital of Georgia. Tbilisi is also called the balcony of Europe, a magnificent city in proximity to the lucrative trading roads of Europe and Asia, not to mention being famous for the breathtaking scenery alone. The participants delivered their idea to the judges and potential team members in a room full of people on Friday evening. As the Georgians are passionate about their socially relevant ideas, Ragnar Sass had to keep them calm and moving on as their passion released their fire within. Also, this time there was an translator present as the level of English is a little low for this Southern country. By Saturday the teams were in full working mode and the first sights of working prototypes have already been seen. It must also be mentioned that during this weekend two other big events are taking place in Tbilisi – the Streetmusic Festival and Georgian Game Jam hackathon, which was visited by our curious Garage48 team. The gaming hackathon featured impressive 10 and 14 year olds pitching their ideas and showing their prototypes to the people, which is something to set an example as to other kids in many countries. The first day of Diplohack started with idea presentations where everyone had the chance to pitch in 180 seconds. Ideas were mainly about social innovation in Georgia. After the pitching, people were mixing and mingling to find teams to work with during the weekend. Altogether 8 teams formed by the end of the night and rushed off to start working. CONTROL YOUR GOVERNMENT - Reporting problems in government, and resolving the issues. Team members: David Shavgulidze, David Demetradze, George Topuria. ANANA - Daily/weekly most discussed issues topics (brief, topics; opinions; future issues). HOLIDAY PLANNER - Choosing the holiday location according to his interests, profile, income and other parameters.Tourist agencies can easily promote their products. Team members: Rati Kunchulia, Guram mazanashvili, Nika chxartishvili, irakli Chalagashvili, Gogi omiadze, Irakli Gugushvili. INNOVATION HUB - Tool to move the country toward a knowledge based economy through promoting the cooperation between business sector and scientific research institutions. WHATSAPP - Categorizing all the discounts/discount codes in Georgia and presenting them in a user-friendly and easily accessible way. Also letting users to leave the feedback about their experience with the specified discount and generating the rankings based on that. MUSIC PRO - Online crowd-funding platform to support street musicians and unknown talents, project with monthly contest, donation and online and offline entertainment. Team members: Boris Kiknadze, Anano Kenkishvili, Giorgi Giorgadze, Nika Shvelidze, Mikheil Skhirtladze, Anuna Bukia, Aleksandre Tkeshelashvili, Giorgi Gogidze. AI - Friendly application which will make everyday life easier. For example: It will change the background noise for the phonecall if you want privacy, also you can chat with the application, know more about weather or routes etc. it's kind of helper. They can add any relevant function according to the consumers needs. TOWNS FOR VILLAGES - Villages and towns are segregated, want to integrate the places together. There is always issue with access to food, want to increase circulation of food products that go out of those villages. Help agricultural farmers to sell food products. Team members: George Matiashvili, Mikheil Rusishvili, Sevda Badirkhanova. WOW - Community driven identification and announcing og problems, allow users to upvote critical issues to make them more visible for government. The system will be really easy to use and covers different platforms. 1. RUPORI - Community driven identification and announcing problems, allow users to upvote critical issues to make them more visible for government. 2. NOTIFICATIONS - Reporting of water, electricity and gas supply problems for municipality in the form of web portal. 3. Portal to understand electronic - no georgian database of electronics. App and website for video lectures, video instructions about electronics. Wiki for electronics including schemes. Educational tool. 4. DEOCCUPY THE SIDEWALKS - Illegal car parking. Mobile app for taking photos of the cars, with locations etc. that will then be reported to police and bad driver will be fined. 5. ZEBRA HUNTINGS - Zebras are non-existing or crossings are violated almost daily. Creating a tool that reports zebra crossing violators by taking a photo and uploading it. 6. CLEANER TBILISI - Tbilisi is most polluted city. Program for crowdfunding reporting of polluted places and forwarding it to relevant authorities. 7. TOWNS FOR VILLAGES - Villages and towns are segregated, want to integrate the places together. There is always issue with access to food, want to increase circulation of food products that go out of those villages. Help agricultural farmers to sell food products. 8. WITHOUT LIMITS - App to enable different disabled individuals to add and enter routes for disabled persons. In Georgia people are not able to move freely. 9. SOCIAL - Daily/weekly most discussed issues topics (brief, topics, pros/cons; opinions; future issues). 10. CONTROL YOUR GOVERNMENT - Reporting problems in government, and resolving the issues. 11. INNOVATION HUB - Tool to formulate state innovation policity, increase science effort. 12. WHATSAPP - Aggregating all the discounts/discount codes in Georgia. Rating the discounts. 13. HOLIDAY PLANNER - Choosing the holiday location according to his interests, profile, income and other parameters. 16. KID SAVER - Identifying, finding and helping street kinds, gypises etc. 17. CHILDREN PSYCHOLOGY - Tool to tell parents how to raise their kids. 18. AI - App to change the background noise for the phonecall if you want privacy. This is a great event and I really wish there'd more events like this in Georgia. Very enlightening and mind-opening. I should say that I never took part in such an event before, so on the big part it was a refreshing experience. Quite daunting, but still very useful. For example I found for myself that I have idea how to manage my time properly. But now I know and I will take that experience to all fore coming events from those guys and girls. DiploHack was a great experience and opportunity to work with new people, mentors and officials for our new startup and together create the new solution that will change the current situation and solve the issues of art, music, unemployment etc. We are passionate to continue working and developing afterwords. THANK TO ALL THE PARTICIPANTS AND SPONSORS! On behalf of our entire team, we thank all the participants and our co-partners who made it an inspiring and memorable event, which proved that Georgia is the next startup region to watch! Until next time! The event is hosted by Garage48, and supported by UNDP Georgia and the Embassy of the Netherlands in Tbilisi, Elva and Association Rural Development for Future Georgia. And don't forget to follow the hashtag #Garage48 in Twitter!